*The land cost is $3380 per person, on a twin-sharing occupancy basis. For single occupancy, add $450 per person. The cost of the expedition includes all photo shoots, sightseeing and transfer services as per the itinerary, all accommodations, all meals (breakfast, lunch, afternoon tea, and dinner), Bhutan government tariff, entry visa, departure tax, a licensed English-speaking guide, a driver and vehicle, but does not include a kitty (per person) of $140 for tips and model fees (if any). It does not include any expenses of personal nature, laundry or any beverages. The cost of international and Druk Air flights from the USA (or elsewhere) to and from Bhutan are not included, and must be arranged so that you arrive in Bhutan on September 23, 2009. Only Druk Air flies in and out of Bhutan, and has flights from/to Bangkok, Calcutta and Delhi. Druk Air flights can only be booked through a Bhutan travel agent and are not included in the price of the photo expedition. A deposit of $300 is required to secure a place on the Land of the Druk Yul photo expedition. This down payment is fully refundable if notice is given 60 days prior to the departure date. The balance of the cost is due 60 days prior to departure date. We will be traveling to areas that are 8000-10,000 feet high. You may experience altitude sickness on some occasions, so please take appropriate medical advice before travel. Our travel agent is Jachung Travel, a Bhutanese-owned tour company based in the Bay Area of California in the United States. This is the same company that arranged the 2006 and 2008 photo expeditions to Bhutan. Tourist infrastructure in Bhutan is still in its infancy, and hotel accommodations are rustic. We shall be staying in small Bhutanese-owned hotel and guesthouses, and while these accommodations are generally comfortable and clean, the quality will be uneven from one hotel to the other. All rooms will have private bathrooms. I assume no responsibility for accidents or injury to individuals participating in the Land of the Druk Yul Photo Expedition 2009. You will be requested to read, accept and sign an agreement which releases me from any responsibility of liability in the event of any of the situations mentioned below. I cannot assume any liability whatsoever for injury, sickness, damage, death, loss, accident or delay to person or property due to an act of negligence of or default of any travel agent, hotel, carrier, restaurant, company, airline, or person rendering any of the services included in Land of the Druk Yul Photo Expedition 2009, or by act of God, act of war or terrorism. Further, no responsibilities are accepted for any damage, changes or delays due to sickness, pilferage, labor disputes, machinery breakdown, quarantine, government restraints, weather or other causes beyond my personal control. No responsibility is accepted for any additional expense, omissions and schedule changes, forced stopovers, rerouting or acts of any governments or authority. I reserve the right to decline or accept any person as a member of any tour or to cancel or alter the tour without notice. It is also the responsibility of the traveler to keep informed on deposit and payment date requirements. It is highly recommended that all individuals obtain adequate travel insurance. 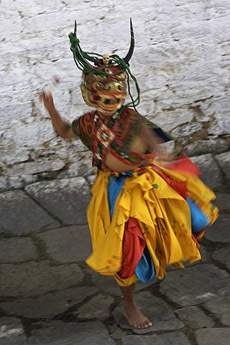 Bhutan, Land of the Druk Yul, is a land wrapped in myth and legend, hidden from the rest of the world by its mountains. 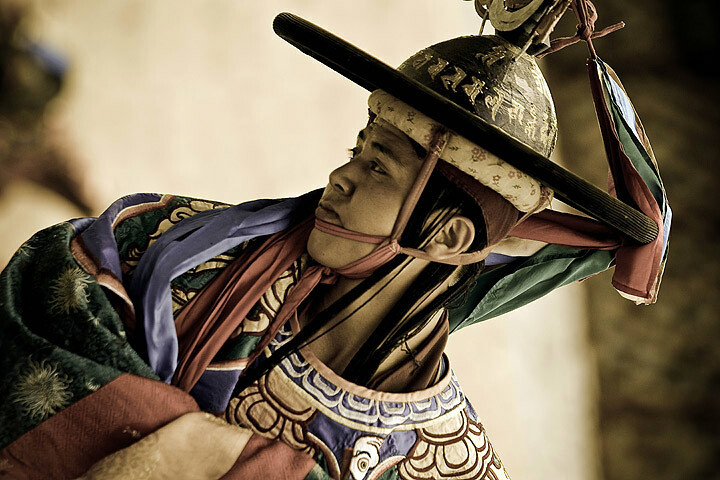 Its legends swirl around supernatural beings, around ancient monastery fortresses and around its Tibetan Buddhist culture. 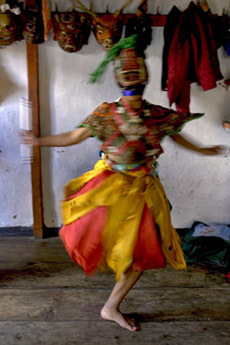 Bhutan's festivals, or Tsechus, offer colorful mask dances and religious performances depicting the unparalleled cultural heritage of this enigmatic country. We will travel to the valleys of Bumthang in central Bhutan; the holiest and most spectacular in the country, where our principal destination is to attend and photograph festivals in the valleys. Our route will take us from Paro in western Bhutan all the way to its heartland, and we will photograph its villages, ancient monasteries, temples and fortresses along our route. Discussions are underway with our agents for various interesting itinerary add-ons. These will be announced once details are available. Participants who are interested in multimedia will be helped to create such projects from their inventory of photographs, and learn how to control story length, intent, pace, use of music and ambient sound, narration, field recordings and interviews. An example of such multimedia projects is Cham! The Dancing Monks of Tamshing slideshow.